This elegant, feminine, classy, and unique glass pearl necklace has been designed and made by Mirela Skikic - USA. This long and complex necklace is made of different sizes of beige glass pearls on silver color beading wire, white silk thread, and with wire. It closes with a silver color lobster clasp. The two last strings are long enough that they can be placed around the neck twice. It looks very elegant with any type of formal and casual outfit. It also can be a nice wedding accessory. In addition, as you can see from the pictures, this necklace can be combined with other pieces from my “Pearl Madness” collection, which also can be found in this shop. It's very similar to ones that many celebrities are wearing. Attached is a picture of Rihanna and her new image with pearls. 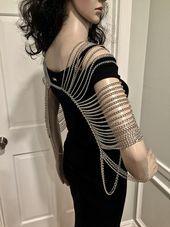 The length of this necklace (longest strip) from the lobster clasp to the middle is 30” (entire length of the longest strip is 60”) – plus about 2” more in additional chain. If you want to combine it with other pieces, contact me before checking out to receive a discount of 10% of the total purchase. This offer cannot be combined with other coupons offered in this shop.